Breaking news, needle found in haystack. A new technique has been developed that can be used to screen otherwise unidentifiable bone fragments to allow identification to species level. The technique relies on the fact that all animal bones contain slightly different sequences of proteins and peptides in them, which correlate to species. So if these can be measured, a ‘fingerprint’ can be obtained. The method is called ZooMS, which means zooarchaeology by mass spectrometry. 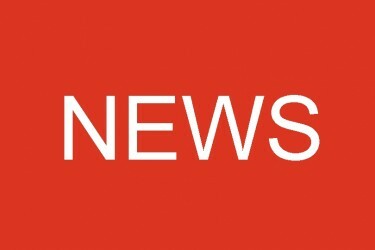 Its advantage is that it can generate results extremely quickly and at much lower costs than techniques such as DNA analysis. 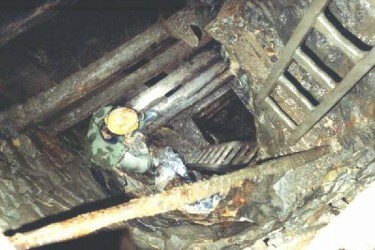 An obvious testing ground for this technique was Denisova Cave, in Siberia. 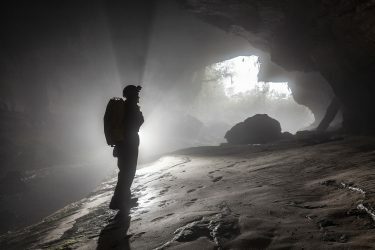 In recent years this cave has yielded small fragments of a previously unknown hominim (a member species of the taxonomic tribe Hominini, the evolutionary group that includes modern humans and now-extinct bipedal relatives) the Denisovans. Until recently, researchers have found just one finger phalanx and two teeth which DNA analysis showed to be from this new species. They have also identified one toe phalanx as being from H. neandertalensis, a Neanderthal. One of the problems with researching the finds from Denisova is that approximately 95% of the bone that has been collected is unidentifiable, notably much of it has been heavily chewed by hyaenas. 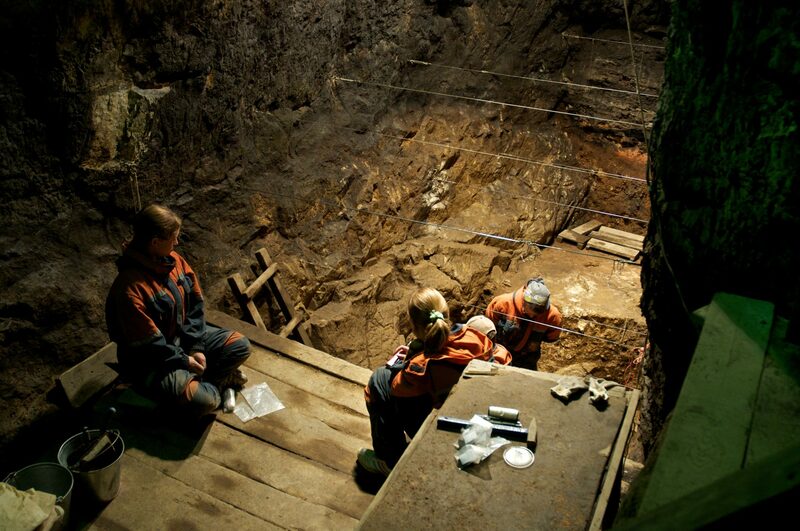 In 2015, Tom Higham and Katerina Douka of the Oxford Radiocarbon Accelerator Unit, University of Oxford (ORAU), visited to the cave and pitched the idea of using ZooMS on the unidentified material to their Russian colleagues, Michael Shunkov and Anatoly Derevianko (Institue of Archaeology and Ethnography, Russian Academy of Sciences, Novozibirsk) They were keen on the idea and Michael Shunkov handed over a large bag of bones later that year. 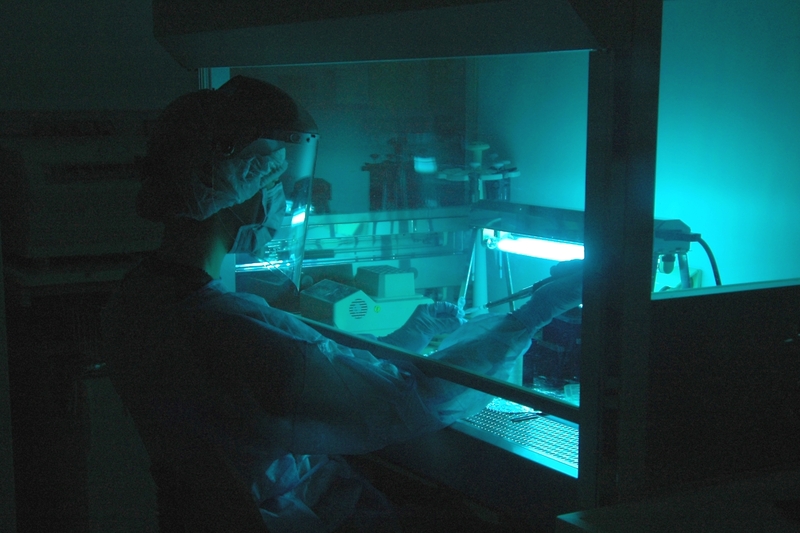 After some initial sampling by Dan Comeskey, also of ORAU, the project was taken on by one of their students, Sam Brown, from Australia, and she started the lab work, preparing the samples for the mass spectrometer work, carried out in Manchester under the eye of Mike Buckley who had developed the technique. Eventually Sam prepared 1,000 specimens from Denisova. The results were interesting, in that they identified mammoths, rhinos, hyaenas, wolves, reindeer, etc, the typical Ice Age fauna. Sam was able to plot the results and show the different numbers of bones and the variety of species. This batch produced no hominims and Tom believed that Sam probably had enough results for her thesis and could stop now to write up her findings. Sam, however, was keen to continue and so they arranged for her to go to Novosibirsk and obtain another batch of samples. Then back to the lab for more preparation work. Eventually, she prepared 2,135 samples for analysis. And this time she hit gold. One sample showed a hominim profile. 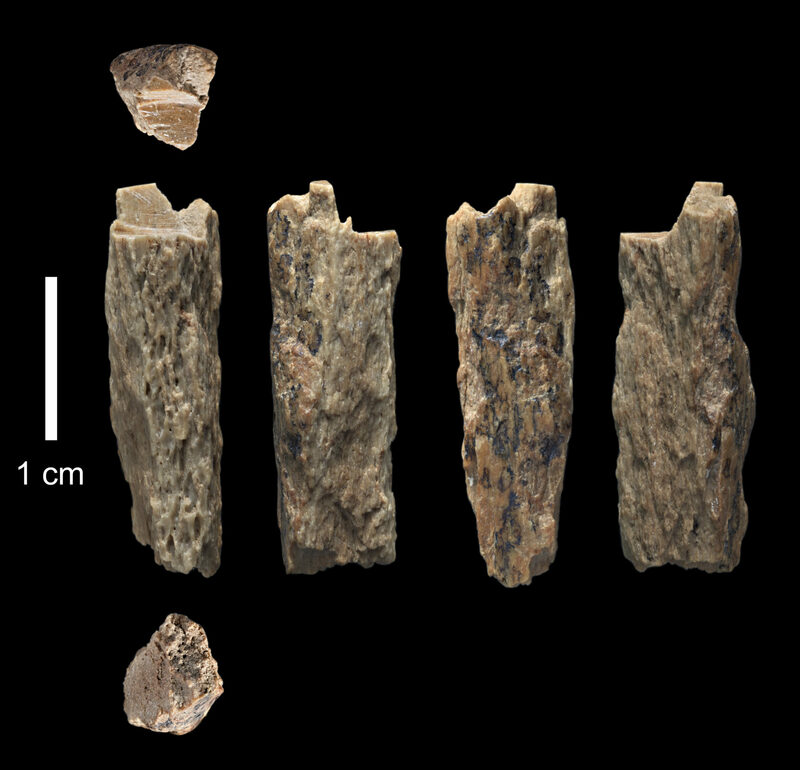 The bone that was identified was small, just 2.5 cm long, but appeared fairly dense and large enough, if well-preserved, for DNA work. Later, more detailed ZooMS work and mitochondrial DNA analysis did, indeed, confirm that the bone was human. But that is not the end of the story. The specimen was then sent to Svante Pääbo in Leipzig. His lab had produced the previous high-quality DNA results from Denisova and he was keen to see what this new human specimen might yield. This is the research that has just been published in Nature. The result is astonishing. 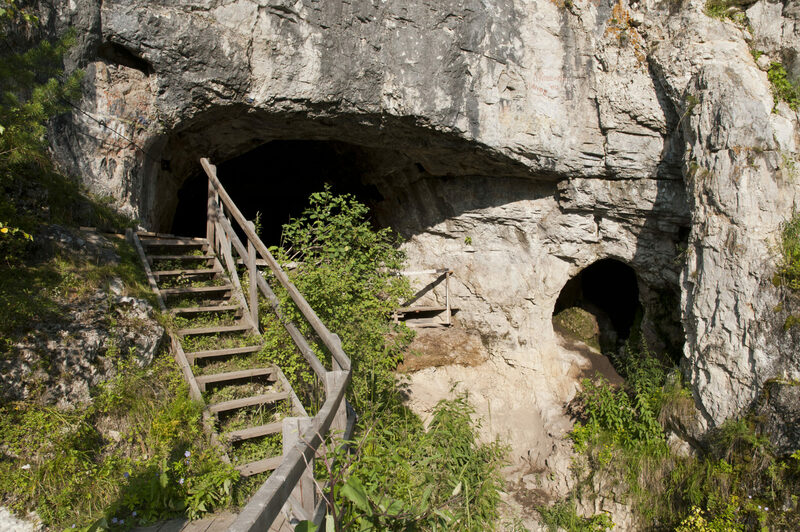 Denisova 11 comes from an individual, a girl at least 13 years old, who had a Neanderthal mother and a Denisovan father. The father, whose genome bears traces of Neanderthal ancestry, came from a population related to a later Denisovan found in the cave. The mother was from a population more closely related to Neanderthals who lived later in Europe than to an earlier Neanderthal found in the cave. Direct radiocarbon dating showed it to be more than 50,000 years old. Like all good research, this has thrown up as many new questions as it has answered. This research was funded by the European Research Council, the Max Planck Society, the Max Planck Foundation and the Russian Science Foundation. Correspondent Graham Mullan with thanks to Professor Tom Higham for his help.